How about uploading that to Debian too? Is there a way to tranfert the data from the N900 to N9? Even if it is only copying and pasting the data from a N900 folder to a N9 one? I am kind of lazy to search for all my show again. About the bugs or improvements, where do you want us to maje our feedback in the end? I’m happy you like SF on the N9. As for transferring the data, try copying the series.db file you have in “/home/user/.config/seriesfinale/series.db” of the N900 to the same place in N9. 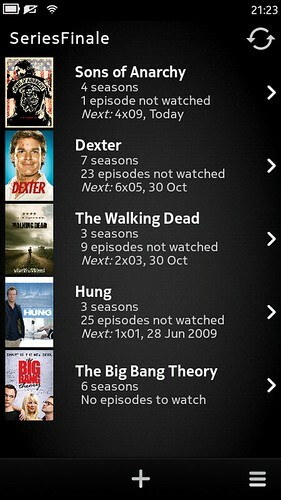 Very nice, I hadn’t even thought I could use an application like this to track watched episodes. Thanks! @Joaquim : Thanks for the link and tip for the transfer. I will try this tonight when I get my hands on my N900. Btw, one feature I would love to see in SeriesFinal oneday is notifications in the event feed, like the app DateEvent App for calendar events! It would be just awesome! you made my day 🙂 Thanks! Nice to finally see SF on the N9. Good UI, but the scrolling needs some “love” 🙂 – at least with more than 10 shows added. The scrolling on the episode lists is fine, so I guess it’s bc of the images? I used the series.db from my N900 and the transfer went smoothly..
Hmmm… for submitting bugs one has to open an developer account at nokia. Arh, I can’t find the file series.db using CuteExplorer. I can’t see the .config folder. How did you do it Thomas ? Thank you very much. I wish I had an N9 to use it on, hopefully I will in the future. I can double check the location of the series.db file but I don’t have my N950 with me right now. Maybe CuteExplorer is not showing hidden folders/files to you? Maybe, which explorer/app should I use ? I don’t know… I always use the console 🙂 and I still don’t have my N950 with me. 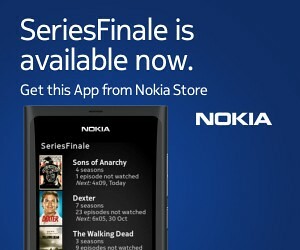 I’ve just confirmed, the series.db is in the /home/user/.osso/seriesfinale/ on the N900. It should be copied to .config/seriesfinale/ on the N950. It might be easier than this but just in case, hope it helps. did it on the console just as Joaquim described. Thanks for the N9 version, very useful app. I hope there will be an update soon to fix a few minor issues such as series number sorting and search not working very well after having already added something. Joaquim you should do a version for Symbian Belle. We have no app like this. I love tv series. Please. I’m not currently thinking of porting SF to Symbian. Maybe in the future… who knows. I tried posting on both TMO and MeeGO (http://forum.meego.com/showthread.php?t=4060&page=3) but to no avail. The listing order is now working either by Alphabet or Date which becomes a bother when you have a long list, lol. I love this app. Using it everyday. But I can’t find the source code. Can you point me to it? could you please port it to Nokia Belle. I’d love to see it on my Nokia 500.